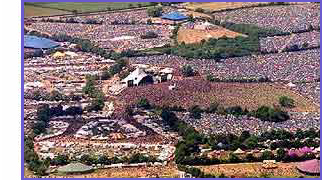 As 2010 gets underway, one of the highlights of this year’s musical calendar looks to be the sold out 40th Anniversary of Glastonbury Festival in June (23-27). U2 have already been announced as headliner of the opening Friday night and now, Emily Eavis has strongly hinted at a return from Dizzee Rascal. This morning (04 Jan), 6 Music’s Lauren Laverne caught up with Emily Eavis from Worthy Farm in Somerset to find out how plans for their 2010 offering are coming along. "We are working on it full time and we’re trying to get our third headliner at the moment which is quite exciting," she explained. As for the rumours, Emily remained tight-lipped on whether the Rolling Stones, Chemical Brothers, Robert Plant, Bob Dylan or Pixies would be appearing at the event. She said Will Young, who has made himself a home with sets on the Avalon Stage "might be making an appearance". As for the popular UK rapper Dizzee Rascal, who gave a high energy performance on the Pyramid Stage last year, Emily said: "We’ve gotta have Dizzee, I think that’s a given." One act that can be crossed off the rumour board is American rockers Green Day, because Emily said they would not be on the bill this year. While she couldn't give much away, she said there are some big plans afoot. "A lot of bands really want to play but because we’ve only got three nights to headline, I think a lot of people are going to be doing secret sets," she said. "There will be a lot of surprises, more than we’ve ever had. "It’s really interesting booking it because a lot of bands are saying, 'We really want to do it but how about we open the Pyramid Stage rather than close it?' And it’s like, 'That’s a good idea'. There’s quite a lot of stuff going around, so that’s exciting."